Really Snowing Photo Frame Makes Every Picture Look Like It Was Really Snowing… Not Really | OhGizmo! By Andrew Liszewski on 09/02/09 • Leave a comment! 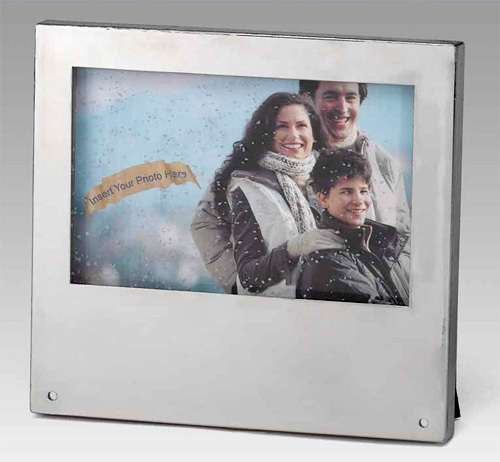 Yep, it’s a 4×6 standard photo frame (ie non-digital) that features an extra layer over the picture filled with fake snow flakes. But instead of having to shake the frame like a snow globe, there’s a proximity sensor that will automatically cause the flakes to swirl when somebody comes near the frame. So even if your ski trip was ruined by a lack of snow, the photos you took will at least look like a winter wonderland. $24.99 from ShopGadgetsAndGizmos.com.